Now here’s something to look forward to! I’ve popped this exhibition on my calendar as a must do, as a chance to catch the work of a few friends and acquaintances. I love print-making, and works on paper are just my kind of thing. Fabric includes the work of a number of artists who were involved with the very successful Pink Lady Art Exhibition. I’ll be watching out for pieces by Louise Einfeld, Trudy Rice, Sue Picot & Lisa Sewards. 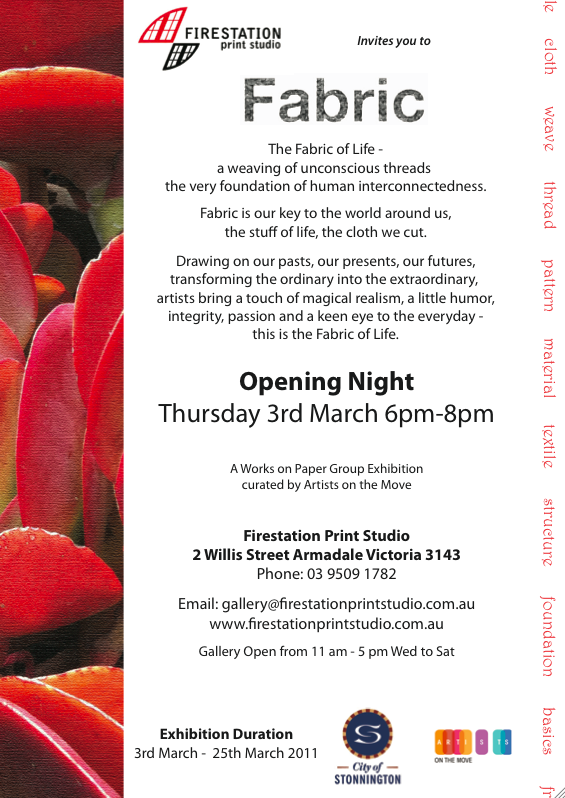 The exhibition is on from 3 March to 25 March at Firestation Print Studio, 22 Willis Street, Armadale. Opening Night is Thursday, 3rd March (6 -8pm). Stay tuned if you’re interested in a run-down, I’ll work on a bit of a write-up once I’ve seen the show.